Congress is again turning the pressure up on the Trump administration to provide answers about the murder of Washington Post columnist Jamal Khashoggi as a deadline arrived Friday to detail any role played by Saudi Crown Prince Mohammed bin Salman. President Donald Trump released an extraordinary statement in November, standing by the young crown prince and saying the world may never know whether he was involved. His top advisers, including Secretary of State Mike Pompeo, say the U.S. investigation continues and point to the sanctions on the 17 Saudi officials who carried out or helped plot the attack on Khashoggi. But Republicans and Democrats on Capitol Hill, who have reviewed U.S. intelligence on the issue, say that's not enough. New intelligence has also been revealed, possibly showing how intense Prince Mohammed, sometimes known by his initials "MBS," disliked Khashoggi, a royal insider turned critic, and increasing the pressure on the Trump administration to do something. President Donald Trump shakes hands with Saudi Arabia's Crown Prince Mohammed bin Salman in the Oval Office of the White House, March 20, 2018, in Washington, DC. The crown prince reportedly told a top aide that he would "use a bullet" on Khashoggi if the columnist would not return to the kingdom and stop writing critical pieces about him, the New York Times reported Thursday, citing former and current intelligence officials. MBS made the comment about killing Khashoggi if he did not let up on his criticism, a source briefed on the intelligence confirmed to ABC News. While there are varying translations of what he said and debate about whether he used the term "bullet," the general point was clear, the source said. 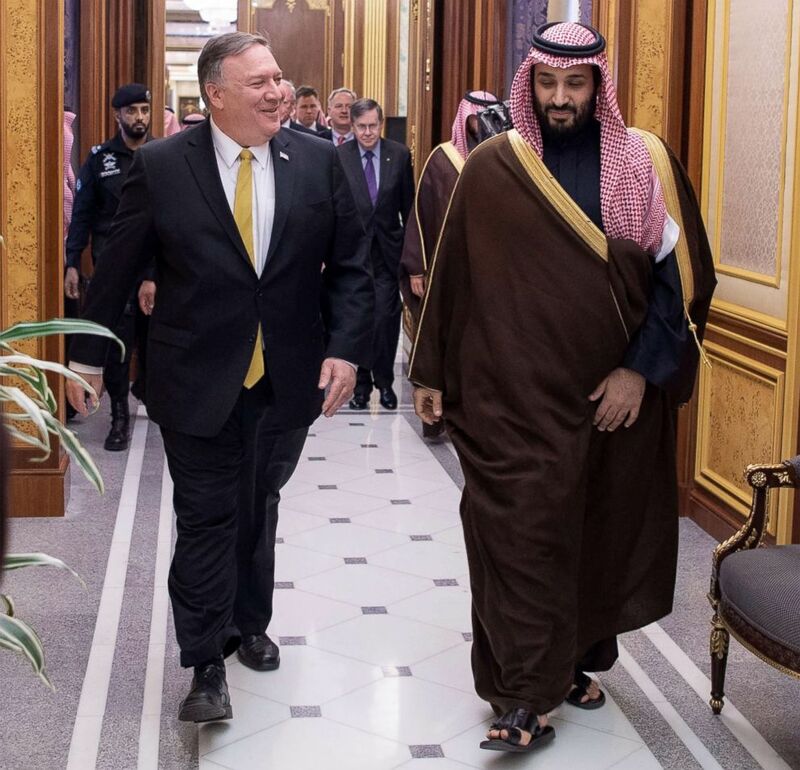 Despite that mounting evidence of Prince Mohammed's possible involvement, Pompeo told reporters there was no "direct evidence" that tied the crown prince to the murder. Members of Congress who have also reviewed U.S. intelligence say otherwise. Sen. Bob Corker, left, chairman of the Senate Foreign Relations Committee, talks with with ranking member Sen. Bob Menendez, prior to a committee meeting April 23, 2018 on Capitol Hill in Washington, D.C. In October, Sens. 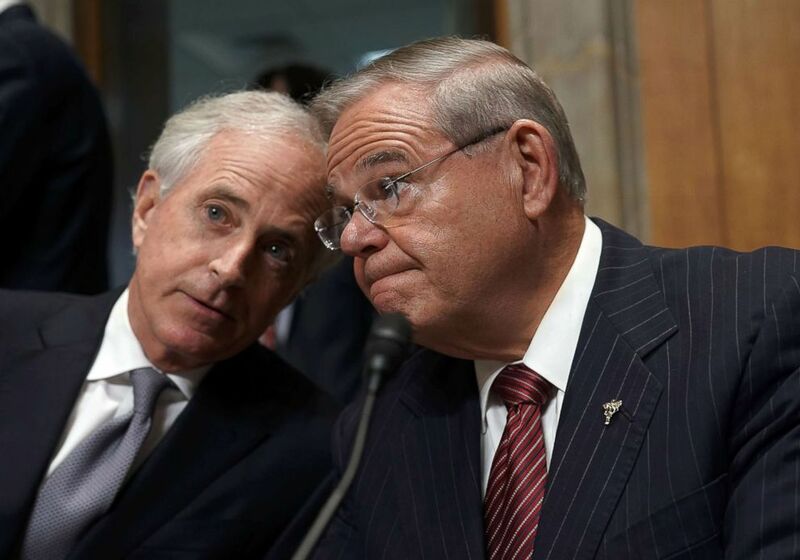 Bob Corker and Bob Menendez, then the top Republican and Democrat on the Senate Foreign Relations Committee, triggered an investigation into who was responsible for Khashoggi's killing using the Global Magnitsky Act, which allows the administration to impose sanctions on foreign government officials for human rights abuses or corruption. The legislation gives the White House 120 days to respond. In November, Corker and Menendez wrote a second letter, asking the White House to investigate specifically whether Prince Mohammed was involved and adding, "We expect to receive your determination within 120 days of our original request." That deadline came Friday, but the White House made not yet made a public determination on MBS's role. In fact, the State Department didn't seem to agree there is a deadline. Deputy spokesperson Robert Palladino said yesterday, "We will continue to consult with the Congress and work to hold accountable those that are responsible for Jamal Khashoggi’s killing ... And of course, we will comply with the law." Secretary of State Mike Pompeo walks with Saudi Crown Prince Mohammed Bin Salman during their meeting in Riyadh, Saudi Arabia, Jan. 14, 2019. But instead of getting into Prince Mohammed's potential role, he pointed to the already existing sanctions on Saudi officials -- an indication the administration believes they have already fulfilled the letter's request. A bipartisan group of senators introduced the Saudi Arabia Accountability and Yemen Act Thursday -- a bill that would mandate sanctions on anyone responsible for Khashoggi's killing and prohibit the sale of certain weapons to the Saudis and the refueling of Saudi-led coalition aircraft in Yemen. The Pentagon has already halted those refueling missions, announcing in November that Saudi and Emirati air forces could fully handle the task, and while the potential for sanctions on Prince Mohammed and the ban on certain weapons sales would be an insult to the Saudis, any sanctions determination would still be the White House's call, meaning the crown prince would likely not be affected. The bill would also require a human rights report on Saudi Arabia and an accountability report for war crimes in Yemen, where Saudi Arabia, the United Arab Emirates, and the legitimate government of Yemen are fighting Iranian-supported Houthi rebels. The legislation would create sanctions on anyone supporting those Houthi rebels, as well as anyone blocking humanitarian access to the country, which has faced a crisis of starvation, disease, and civilian casualties that's put more than 12 million people on the brink of famine. 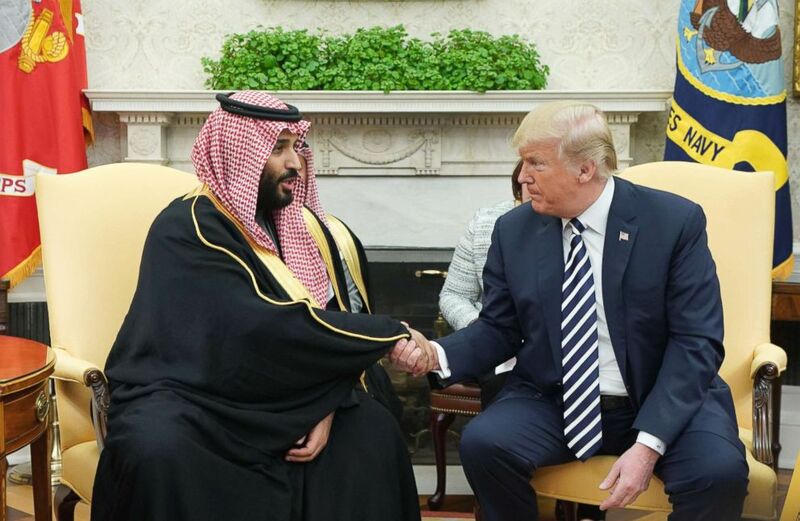 "I firmly believe there will be strong bipartisan support for serious sanctions against Saudi Arabia for this barbaric act which defied all civilized norms. While Saudi Arabia is a strategic ally, the behavior of the Crown Prince -- in multiple ways -- has shown disrespect for the relationship and made him, in my view, beyond toxic," said Sen. Lindsey Graham, a top foreign policy Republican and close Trump ally who introduced the legislation along with two other Republicans and three Democrats. The Senate unanimously passed a resolution last year saying MBS was "responsible" for Khashoggi's killing.